Big Bill Broonzy's Long Tall Mama Is One Of The Best "How To" Free Acoustic Guitar Lessons Online. 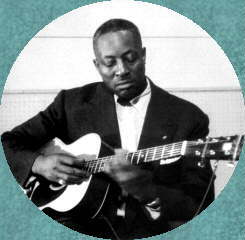 Big Bill Broonzy was a great fingerstyle blues guitar player. This next installment in our series of free acoustic guitar lessons again focuses on blues fingerpicking. Breaking this song down into sections, with the help of acoustic guitar tabs and video, helps make a complex song very learnable. This song is not aimed at the beginning player. To be able to play it smoothly, you'll need to have developed control in both your picking and fretting hands. Let's get to the song. Long Tall Mama is a ragtime blues in the Key of C. It uses the C, F, and F Major 7 chords. Instead of a G chord (the V Dominant 7 chord) in the part of the song where it normally occurs, there's a melodic line played. In fact, the entire accompaniment is a series of melodic lines based on chord shapes. Those melodic lines are one of the most interesting parts of the song. That and the silly lyrics! This song falls under the umbrella of hokum, although it's not as suggestive as other songs in that idiom. The accompaniment on Long Tall Mama stays pretty consistent on all of the verses. There is a little variation from verse to verse on the Broonzy recording, but it's slight enough to not bother notating. The real variations come in the solos. There are four very different solos scattered throughout the song. The best advice that I can give is to learn each part separately from each other, then put them together. Big Bill Broonzy's right hand approach was unique. In this song, the bass isn't as active as it would be in the playing of other players, Blind Blake for example. While bass notes are played, it's not the steady thumping that marks a lot of other country blues. Instead, it sounds like it's thrown in when the busy melodic figure slows down. This, along with the video of Broonzy's playing that's available, makes me think that he played with the thumb and first two fingers. This explains why the bass notes fall away when the figure on the upper strings gets especially busy. It's also clear from video and his recorded sound that he played unshod (no thumb or fingerpicks) and had a strong right hand. Because there are four separate solos in Long Tall Mama, the tabs take up a lot of space. This means that I've had to split the tab into two different files. There are links to both of them below. Like all of the other sheet music files that you'll find at learn-fingerstyle-guitar.com, this is a TablEdit File (TEF). To view the files, you'll need a viewer that's specifically designed to read it. You can download it for free here. This file includes the introduction, accompaniment and first two solos. This one is the third and fourth solos. To hear a playback of the tab, click on the yellow loudspeaker on the tool bar, at the top of the page. The complete lyrics of the song can be found by clicking Score, then Notes on the same toolbar. I learned Broonzy's arrangement as closely as my abilities allow. I did it by slowing the song down using Transcribe!. If you're interested, they offer a 30 day free trial so that you can try it before you buy it. If you're like me, you may decide that you can't live without it! I hope that you enjoy learning Big Bill Broonzy's Long Tall Mama. If you have any questions or comments, please let me know. Ready for more blues lessons? Have You Read Fingerstyle Monthly? Check It Out!